The new production base of higer in SIP was completed and put into use in 2003, with 300 million RMB total investment and 500,000 square meters area coverage. The new plant adopted international advanced technical equipment and the method of transportation in all production processes realized full automation. The new production line realized a specialized, large-scale manufacturing model, with an annual output capacity of 25,000 buses and chassises. The production area of the new production base include six manufacturing sectors: The 1st manufacturing sector is the parts manufacturing workshop that undertakes the manufacturing of the parts and components for all the models.The 2nd Manufacturing sector is welding workshop, which is responsible for the welding of the frameworks of bus and coating of the buses; there are two welding lines in the sector, with a capability of welding the stamped panel type body and framework type body.The 4th Manufacturing sector is the painting workshop, which is responsible for the appearance coating protection and decoration. It has more than 30 large-scale and middle-scale equipment,including sealing, spraying and foaming room, highly air-purified painting room, the grinding room with automatic lifting platform, and track-type sliding vehicles. 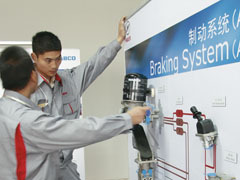 The 4th manufacturing Sector is the bus assembly workshop, which is responsible for the assembling of the internal and external trimming parts . Currently it is divided into two assembly lines, of which the production process is composed of 12 assembly stations. The 5th manufacturing Sector is the chassis assembling workshop, which is responsible for the assembly and test of Higer bus special chassis, and the test ofthe completed vehicles. The 6th manufacturing Sector is the trial production workshop, which is responsible for the trial of the new bus and the chassises. The whole plant is a modern automobile industrial park, which integrates chassis assembling, completed vehicle production, parts and components installation and vehicle testing, and merges various functions of manufacturing, research and development, vocational training and so on. The use of the mew plant has fully enhanced Higer's manufacturing capacity, becoming a strong supporter for Higer's further development. In terms of the material management, by combining its own characteristics, Higer implements an advanced MRP Ⅱ system to conduct the effective management on materials ,capital, technology, manpower, equipment and other manufacturing resources, and through market driving realized a dynamic production planning and organization to promote working efficiency and significantly reduce inventory, speed up cash flow, and enhance the enterprise's ability to meet the change of the market. In terms of quality control, Higer strictly abides by the authoritative international automobile quality system TS16949 and the national compulsory 3C certification and implements a full-staff and whole-process quality management. From the purchase, production to vehicle storage, there have been established a set of strict quality control systems for each step. As for outsourcing components, the company has set up the suppliers’ quality files, carrying out regular assessment to the quality of supplying goods. On the production site, the combination of point inspection and self-inspection is applied, and quality inspection through the whole process is implemented. In order to enhance vehicle safety, the company has also set up a safety committee to conduct an overall check every week. The company also established a whole vehicle inspection system, and constructed an inner testing track of the factory to fully ensure the technological stability and security of the bus products.